GuDa Audio included Euterpe XL in our January 2017 goody bag. 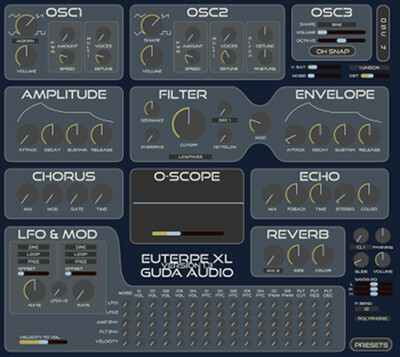 Euterpe XL is a power house synthesizer with 4 oscillators, multi-mode filter, built-in effects, LFOs, modulation matrix and a powerful online pre-set browser. Save and browse pre-sets online and offline. Share pre-sets with other users by saving them publicly. Easy to change colour themes and looks.